Nobody should ever fear armed aggressors or terrorists because our esteemed POTUS is capable of neutralizing all of them--personally--even if he is not armed! All one has to do when in fear of an active shooter is to send a Tweet to tRump, and he will instantly arrive on the scene, to save the day for everyone. I guess even an AR-15's bullet can't penetrate all that fat and hairspray! I think that all of the Dippity-Do that he uses in copious amounts in order to keep the side-pieces of his world-class comb-over in place over his ears might also play a role in his total and absolute immunity to bullets. Who knew that we would have a comic book-style super-hero in The White House? Please! 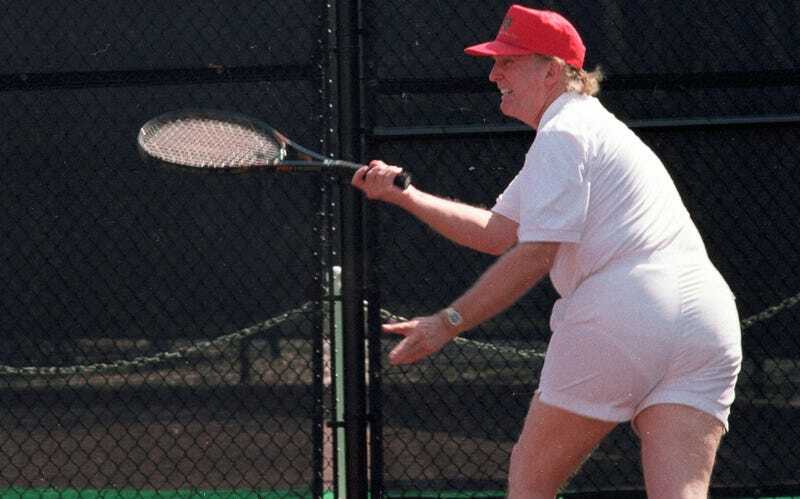 The POTUS weighs only 239 lbs, as evidenced by this photo of his svelte physique. And, he has gained one inch in height as he has aged. If you don't believe me, just ask his physician, who swore to those statistics.